What first drew me to Sloane Tea was its stunning packaging. I loved the pretty patterns and gorgeous colour palette and immediately purchased a few tins as gifts for my tea-loving friends. Not long after, I had the pleasure of meeting Hoda Paripoush, a Certified Tea Sommelier and founder of Sloane Tea. And now I am hooked on their amazing teas. Hoda travels the world to select her premium teas from tea estates in India , China, Japan and Taiwan. With a background in perfumery and fragrance blending, Hoda developed Sloane Tea into a luxury brand of scented and blended teas. As can be expected, she brews an amazing cup of tea that smells, tastes and looks beautiful. 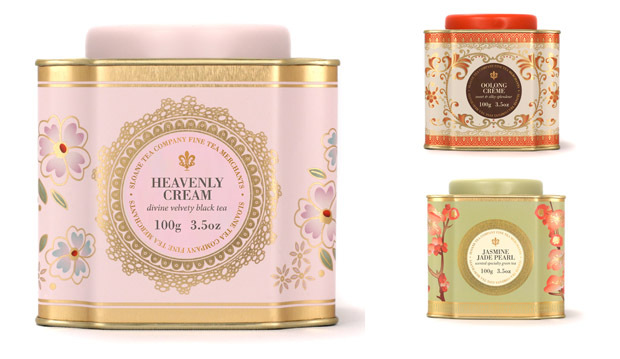 My favourite is "Heavenly Cream" - A divine tea, full of creamy richness and velvety smoothness- heavenly in every way. A beautiful long leaf Ceylon is blended with balanced notes of bergamot and creamy vanilla, according to their website. And if you are not a teatotaller, Food & Drink magazine featured cocktails made with Sloane Tea last fall. How fun! A recipe for a Marrakesh Mule using Marrakesh Mint Tea can be found on the LCBO website. It is available on line at sloanetea.com as well as at gourmet food shops and better gift shops. ( A list of retailers is available here. ) Or visit their beautiful pop up shop in downtown Toronto. I will definitely be paying a visit.